We have been poked and prompted to go and check out Teras restaurant on Wood Street since it opened – but it’s only been open 8 days and there is such a stir, what are they doing!? We decided to go as soon as possible – which turned out to be ‘tired-on-a-Tuesday’ this week. Bold branding on the front makes the place look like any other E17 kebab shop. 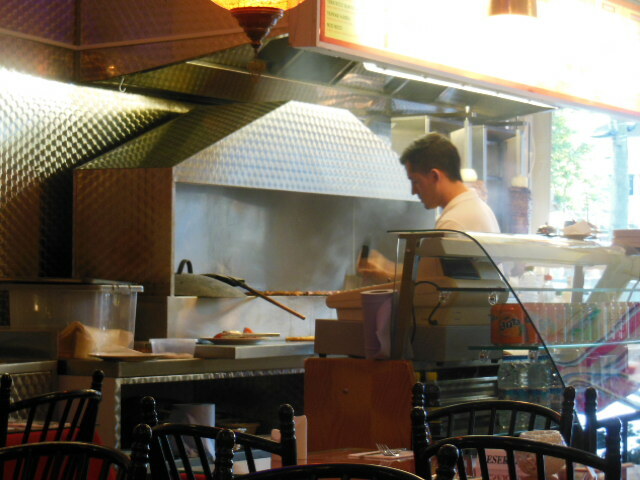 However on entering we slipped back to the ocakbasi BBQ restaurants in Istanbul. 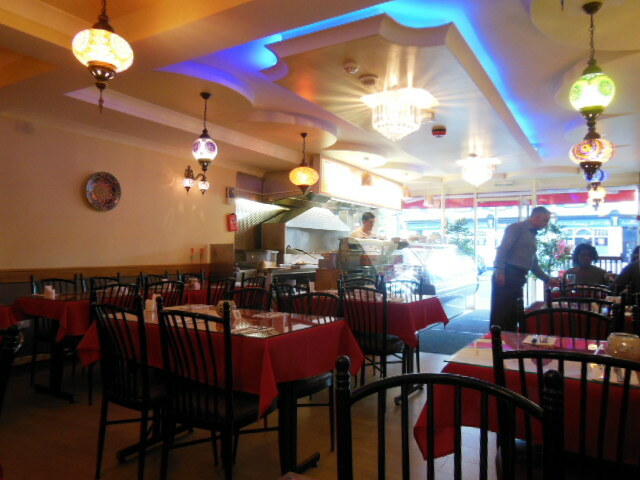 The takeaway counter is dominant at the front, but beyond that it is a small, friendly local restaurant, beautifully decorated with lanterns imported directly from Turkey by the owners. This former cafe was owned by the same guy for 15 years until he retired and his family have transformed it into a Turkish BBQ restaurant. Unfortunately they had run out of the red mullet barbunya pilaki, apparently it’s made daily and we missed out. 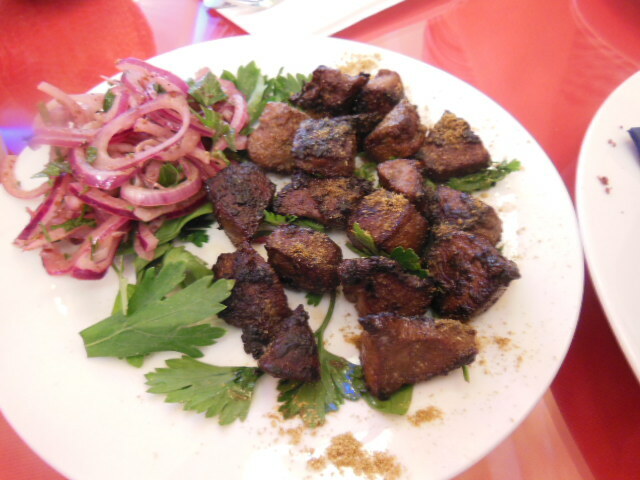 We ordered a couple of hot meze instead – arnavut cigari (grilled liver with onions) and karides (prawns with peppers.) Both dishes were fresh and well cooked, the olives, fresh bread, homemade chilli and garlic sauces arrived without asking too. The sumac sprinkled around the prawns was astounding – I’ve read about this spice being an alternative to fresh lemons but never realized why until we tasted this – the owners import it fresh directly from Turkey in small batches and it was amazing! For the mains we’d ordered, ali nazik – grilled chicken served on a bed of roasted aubergines with a yoghurt sauce, and sarma beyti – a spicy minced lamb kebab wrapped in bread and served sliced on chilli and yoghurt sauces with orzo rice – beautifully presented. We had to remind them about the salad which was our only criticism of the meal. Teras is especially good value at the moment with a BYOB until they get a drinks license. We had 2 courses and a coffee each for less than £30. It’s lovely food, cooked freshly to order. The staff, of which there were many, were friendly and welcoming. The owners are new to the restaurant business and keen to build up a local following – with food this good it won’t be difficult. Verdict – a great new local Wood Street restaurant which transports you to a night out in Istanbul – while a lot cheaper than a trip on Easyjet, enjoy! This entry was posted in Restaurants in E17 and tagged Barbecue, BBQ, Istanbul, kebab E17, restaurant, Teras, Turkey, Turkish cuisine, Walthamstow, Wood Street. Bookmark the permalink. I know Feast17 are heading there tonight. Sorry I’m going to miss out on it now! Worth a visit – lovely food. The review above is correct food great welcoming staff great only problem when you are there with a large family and some kids natural noise will occur the staff telling you to keep a one year old quiet however does not really lend itself to a family atmosphere!!!! Thanks for this comment. Will mention it to them. The Mrs and I went there for lunch on Saturday. Good food, nice atmospehere and friendly staff; will be going back on a regular now we have moved to Wood Street! Enjoy – wood street has some lovely local shops. It is actually turning into one of our favs! pleased you also had a fab meal. We were hoping for the standard that you find in Turkish restaurants in Hackney and Haringay and it didn’t reach that standard, which was disappointing so not worth travelling too, but fine if you live locally. Had to ask for sauce to go with Adana Kebab, given garlic sauce not offered the chilli sauce, and the cold meze for 2 as a starter quite poor, a bit of houmous, tacik, coleslaw, cous cous salad, fried aubergine and pepper. Sorry to hear about your experience. We really like Teras and have had really lovely food and good service. Can’t agree this place is excellent good food friendly staff I will go again and again. X.
Lovely food great service in the restaurant and even when waiting for a takeaway.. The best food in London !!!!!! !